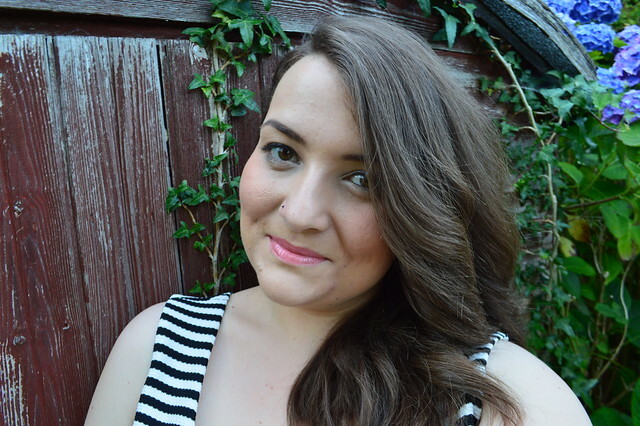 Pinkclove.co.uk is home to a great range of clothing in sizes 16-32. They translate the latest trends from the catwalks and convert them to evening and day wear. 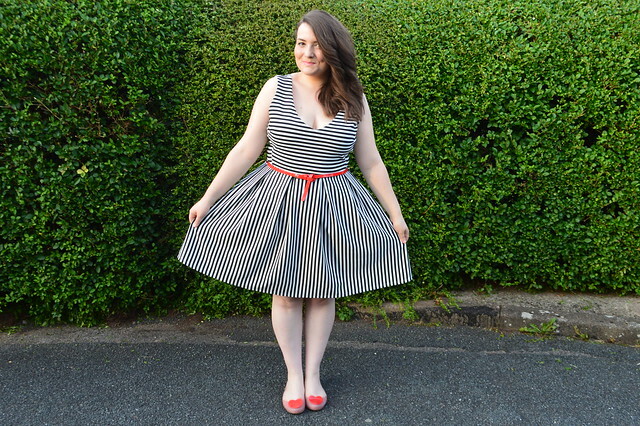 Everything is very affordable and the striped dress I'm wearing retails for £24. It's a very heavy textured material instead of a flimsy jersey and is the perfect length for work coming in just above the knee. It came with a black patent belt but I swapped that to tie in with the shoes I wore. I've already worn this a handful of times and I know it's going to be a reliable addition to my wardrobe. Georgina looks gorgeous in one of their dresses too which I'm very tempted to buy myself. 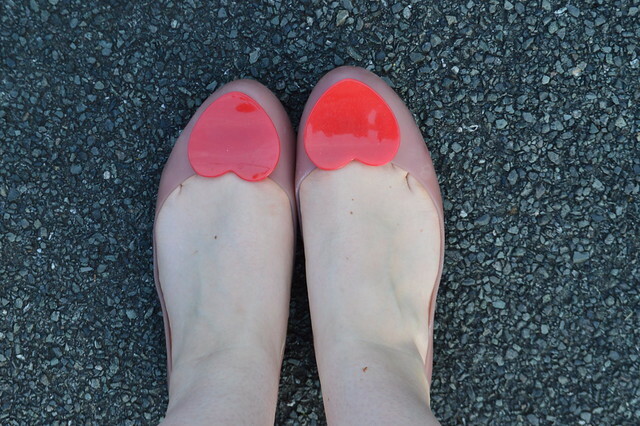 I've been wearing these Mel shoes loads this summer, they are super comfortable and perfect for the beach because you can wear them for paddling in the sea because they are jelly shoes. I do get a few odd looks when I wear them though, a lot of people aren't ready for plastic shoes with shiny hearts on them. I really want to get these shoes in the navy blue and pink version too. By the time this is published I will be on my way to West Wales for a short break, I can't wait to relax on the beach and unwind for a few days. Hope you have a lovely week and I'll see you all soon! I love this! I always wish I had more stripes in my wardrobe. And people CLEARLY don't know style even when it's got plastic hearts attached to it! You look gorgeous! So simple yet so lovely. Btw, you can try using personalized sunglasses to complement this outfit. LOVE this outfit on you - perfect dress and shoes combination. I love the shoes, I've never seen anything cuter! they just remind me a bit of alice in wonderland! Lovely dress. I like how the pinstripes are vertical, then horizontal. The pop of red really makes the dress. This dress is beautiful on you, you are so pretty! Aww you look lush! 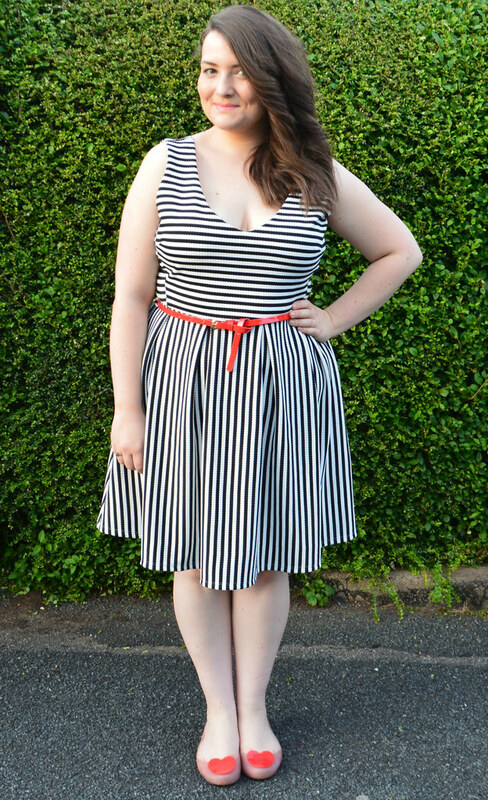 I love a good stripped dress!